The Xbox One X is here and both Grocs and I were there from day one getting our games up and running on Microsoft’s new machine. In our cases they are both the Project Scorpio edition consoles (ie. a limited run launch version) but the experience will be similar to the standard edition machines that are also available. Both of us are approaching this for different angles so it warrants us sharing our thoughts together to give a less biased view. My current gaming set up includes a launch Xbox One with an old Samsung 1080p screen and slow Internet so I can look at it as a gamer wanting a better experience with their current set up. Grocs has a new LG 4K screen which currently has an Xbox One S hooked up with fast Internet so can approach the review from someone with the gear to see it at its best. My impressions on opening the box is that there is little wasted space. The console takes up the majority of the box and is held securely while the remaining space is reserved for the bundled controller, power and HDMI cables. The controller is not the Elite version as I bet a lot of people would have hoped for but the second generation version of the original that launched with the Xbox One S. Its a nice step up with enough tweaks (including Bluetooth support) to make it a versatile option for both your console and PC. The vertical stand, which is a bonus extra for the Scorpio edition, barely takes any room at all in the box. The first thing you notice when removing the console from the packaging is just how small it is compared the the Xbox One. What it lacks in size though it makes up for in build because it is one solid piece of machinery. This thing could be a dangerous weapon in the wrong hands. She might not look like much but she’s got it where it counts, kid. The new console is absolutely incredible in terms of the power it can pump out in such a small box. In the Project Scorpio Edition you also get a console stand as well, which I am using as the Xbox One X looks great standing vertically. I’m amazed that the unit is actually slightly smaller than the Xbox One S.
Having to completely unplug everything related to the Xbox One was a bit of a pain and it was with some regret I was saying goodbye to the Kinect sensor too. For a time it was pretty being able to switch on/off the machine through voice. The size of the console is so much smaller than the Day One Xbox One I have that instead of stacking an external HDD on top of the machine I can safely place a pair of them to the left of it on the nook of my entertainment cabinet. Yes, I added another drive to the mix now so am sporting 2x2Tb HDDs as well as the internal 1Tb one of the console. Which is lucky as the biggest annoyance has been dealing with the updates. Not only was there an 800Mb system update but my slow Internet pretty much brought any additional updates to a frustrating halt. With so many games popping up with their 4K updates at launch you could be flooded with patches from the moment you start using your new console. It would have been nice to see more of those happen ahead of time to soften the impact. Even the network transfer tools can be somewhat spotty on their operation under these circumstances so if you have extra space on an external HDD, stick with that method. Three generations of controllers: Xbox One Day One Edition (top left), Xbox One X Project Scorpio Edition (top right), Xbox One Elite (bottom). Setup was pretty straight forward. Unlike Night Owl, who struggles with a pretty slow internet connection the 800 mb patch didn’t take long to download for me, but verifying and then installing took about 20 minutes. I used the backup to external drive method and it worked great in terms of restoring a lot of the settings. One thing I did find odd is that the video settings defaulted to 1080p, but changing that to 4K soon fixed that issue. Of course, with the saves in the cloud you also have to re-download all of those onto the new box. Don’t forget to set the new Xbox One X as the primary console too if you plan on only having one in the household. Another great feature is just how quiet the Xbox One X runs. Compared to the PS4 Pro, it is much quieter and the heat dissipates really well via the vapour cooled chamber. Early impressions are that it does make your old games run “better” but on a 1080p screen the impact of that may vary. 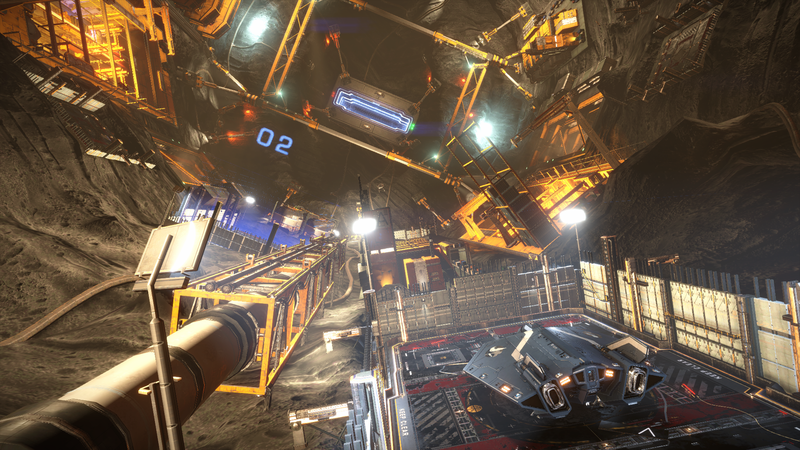 With Elite Dangerous what was immediately noticeable was how much clearer the HUD text was to read. Some elements of the display that were borderline unreadable on older HDTVs come up nicely here. I can imagine that for games that rely on text or complex menus this could really help out players. Wolfenstein II: The New Colossus has also been given a good workout and the game runs brilliantly. Not everything is perfect yet and it seems that many of these games are getting additional patches to fix up problems encountered post launch but it does appear that everything is improving. The snappiness of the Xbox Dashboard is nice to see and feels like it should have been like this from the very start of the generation. With the features and new UI that is a part of this update it is finally acting like a true successor to the Xbox 360. I think to truly appreciate the graphical boosts coming from the machine you’d likely still need a relatively new 1080p set that’s got great picture quality. Early or older sets like mine might just be too outdated to really do the imagery justice. Using the Insects interactive demo to switch between 1080p and 4K supersampling did show a significant improvement in image detail though. Needless to say, I’ll be looking at a 4K screen in the future. Even hectic moments in shooters like Wolfenstein II: The New Colossus run silky smooth on the Xbox One X. This is why you buy the upgraded Xbox One and that is to play the games. What amazed me was just how many games have been patched already to provide proper 4K support. I found that loading times were a bit quicker, particularly on titles that didn’t have specific 4K assets associated with them. A lot of the games I’m playing now have had huge boosts in graphical quality. Microsoft weren’t kidding when they said this was going to be the most powerful console ever. I am blown away about how good games look in 4K, whether it be checker-board or native 4K. For me the new X is comparable to going from the original Xbox to the Xbox 360 in terms of graphical jump. When the Xbox One came out in 2013 it clearly was under powered against the superior PS4 and the graphical jump from the 360 to the Xbox One wasn’t as noticeable as you would think. I can’t say that now with the X. This is the big graphical jump you’ve been waiting for and in my humble opinion a much bigger leap from the original Xbox One. The cost of all this amazing graphical fidelity? A lot of patches, at least at first. If you were preparing early you would have downloaded a lot of the 4K assets early, but this doesn’t stop more patches being released since the launch of the X while the developers optimise effectively for the new console. Games that haven’t even specifically been patched for the X still run a lot better too. If the game has a locked resolution (like the early 720p games like COD Ghosts, or Dark Souls 3 at 900p for example) then you will not see resolution boosts for these games. What you will see is nicer looking textures due to the 16x anisotropic filtering and a much smoother frame-rate. I really enjoy The Golf Club 2 and it does look nicer and run at a much more stable frame-rate without any additional patching. For someone looking for an upgrade to their original Xbox One, this will have a much bigger impact than only going up to an Xbox One S. Everything simply works better. But if you really want to see it at it’s best then you’ll need a good screen to go with it AND a hefty Internet cap too. Effectively this console is a decent mid to high range PC and I’m really looking forward to seeing how developers continually improve what the console can do over the next few years. I’ll happily game on this beast now instead of having to upgrade my PC every year or so. I’m glad you guys are enjoying your new console. This Christmas I’m buying two more Nintendo Switch consoles so my wife and kids would stop playing mine :). The Xbox One X… is a pretty console for sure, but it’s definitely not for me. The only time I see my Switch is when everyone is asleep and by then I’m usually too tired or not in mood to game on it anymore :). Buying a $500 console would probably make buying new games hard for awhile so I understand your point there :). Great post, I too was really impressed with the performance and overall quality of how games were running. However I opted to eventually stick to just running in 4K and not 4K plus HDR. Games would run smoother with that mode off, and difference in picture really wasn’t that much. It’s interesting you mentioned HDR because I can’t think of anyone who has been doing performance comparisons of the machine showing the difference with having HDR on/off. Yeah I havent seen many people bring it up either to be honest. Overall the picture you get in HDR mode on is nicer, but performance certainly takes a hit. But it also depends on the game. In Gears of War, you can play in 4K HDR which runs at 30fps and the other option is 60fps with HDR off. Not all games give you this option though! Also it is down to your tv aswell, my tv has a setting for having HDR on & off aswell as a “Game mode” in the description it tells you thats picture quality may decrease a little, but you dont get things like lower frame rate, input lag and so forth. To be honest, I think the “HDR” tag is a bit of a gimmick. Playing in just 4K gives you a great picture and gameplay. Which is achievable as its a racer, but be interesting to see if later down the line more intense games can offer the same.